This article is about the names of Vishnu. For the actor, see Govinda (actor). For other uses, see Govinda (disambiguation). Famous image of Govinda, now in Jaipur. Govinda and Gopāla (Sanskrit/Hindi: गोविन्द/गोविंद and गोपाल) (also known as Govind, Gobind and Gopal) are the names of Vishnu which mean Cowherd and Protector of Cows. These names are also popularly addressed to Krishna, referring to his youthful activity as a cowherd boy. This name appears as the 187th and the 539th name of Lord Vishnu in Vishnu Sahasranama. Lord Vishnu or his complete incarnation Krishna are regarded as the Supreme God in the Vaishnava tradition and also by much of the pan-Hindu tradition. According to Klaus Klostermaier, Kumar Gopijanavallabha – Krishna the lover of the Gopis – is the latest stage in the historical process resulting in contemporary Krishnaism, being added to the worship of Bala Krishna (the Divine Child Krishna), and the original cult of Krishna-Vasudeva which may date back to several centuries before the Common Era. Both names translate to "cowherd". Sanskrit go means "cow"; pāla and vinda form tatpurusha compounds, literally translating to "protector of cows" and "finder of cows", respectively. Govinda is a name of Krishna and also appears as the 187th and 539th name of Vishnu in the Vishnu Sahasranama, the 1000 names of Vishnu. The sages call Krishna "Govinda" as He pervades all the worlds, giving them power. The Shanti Parva of the Mahabharata states that Vishnu restored the earth that had sunk into the netherworld, or naraga in Tamil, so all the devas praised Him as Govind (Protector of the Land). Alternatively, it means "He who is known by Vedic words alone". In the Harivamsa, Indra praised Krishna for having attained loving leadership of the cows which Krishna tended as a cowherd, by saying, "So men too shall praise Him as Govinda." Maharishi Mahesh Yogi, in his commentary on the Bhagavad-Gita, states that Govinda means "master of the senses". In the Mahabharata, when Draupadi's saree was stripped by Dushasana in the court of Hastinapura, it is said that Draupadi prayed towards Lord Krishna (who was in Dwaraka at that time) invoking him as "Govinda" at the instance of extreme distress where she could no longer hold her saree to her chest. For this reason, it is believed that "Govinda" is how the Lord is addressed by devotees when they have lost it all and have nothing more to lose. This may be the reason why in colloquial Tamil and Telugu the slang-term "govinda" sometimes refers to the prospect of losing or failing in something important. 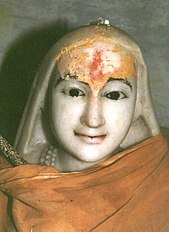 A famous prayer called the Bhaja Govindam was composed by Adi Sankara, a summary of which is "If one just worships Govinda, one can easily cross this great ocean of birth and death." This refers to the belief that worshipful adoration of Vishnu or Krishna can lead believers out of the cycle of reincarnation (samsara) and lead them into an eternal blissful life in Vaikuntha, 'the supreme abode situated beyond this material world' where Govinda (Vishnu) resides. Adi Sankara's Bhaja Govindam prayer expresses the value of inner devotion to Vishnu. ^ Klostermaier, Klaus K. (2005). A Survey of Hinduism (3rd ed.). State University of New York Press. p. 206. ISBN 0-7914-7081-4. Present day Krishna worship is an amalgam of various elements. According to historical testimonies Krishna-Vasudeva worship already flourished in and around Mathura several centuries before Christ. A second important element is the cult of Krishna Govinda. Still later is the worship of Bala-Krishna, the Divine Child Krishna—a quite prominent feature of modern Krishnaism. The last element seems to have been Krishna Gopijanavallabha, Krishna the lover of the Gopis, among whom Radha occupies a special position. In some books Krishna is presented as the founder and first teacher of the Bhagavata religion. ^ Maharishi Mahesh Yogi on the Bhagavad-Gita, a New Translation and Commentary, Chapters 1–6. Penguin Books, 1969, p 57 (v 32). Hein, Norvin (May 1986). "A Revolution in Kṛṣṇaism: The Cult of Gopāla". History of Religions. 25 (4): 296–317. doi:10.1086/463051. JSTOR 1062622.